The Peewee BB Crunch played in the Provincial Championships this past weekend and ended up in fifth place in the province. They opened the tournament with a 2-1 over the Kitchener Lady Rangers. Claire McConnell scored both goals with assists by Taryn Landine (two) and Chloe Davey. Keyra Herrington stopped three breakaways in the first period and another two throughout the game and held the Rangers to just one goal for the win. The Crunch followed that with a 2-1 victory over the North York Storm. Kristen Sutton scored both goals and Diana Wharton stopped a barrage of shots in the final period to earn the win. Their win streak was snapped at two however as in their next game Napanee lost 2-1 to the London Devilettes. Stella Sutton Scored assisted by Kristen Sutton. Needing a win to keep their tournament hopes alive, the Crunch responded with a 1-0 shutout win against the Oakville Hornets. Kristen Sutton scored the lone goal and Wharton held off all shooters to earn the shutout. That win advanced the Crunch to the quarter-finals where they lost 2-1 to the Carleton Place Cyclones. 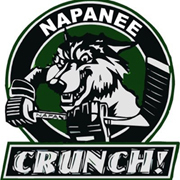 Napanee jumped out to a 1-0 lead on a goal by McConnell. Landine made a nice move to beat the defenceman and passed it to Nicole Geenevasen who spotted McConnell in the slot and fed a perfect pass for a one-timer. It was a good back and forth game with plenty of chances at both ends. The Crunch got caught on a bad line change in the second period, sending two Cyclones players in alone and they didn’t miss. The Cyclones would seal it with a fluke goal in the third period, shooting one off of Herrington’s mask, which deflected down, off her shoulder and fell in the net. Despite the loss, the this Crunch team saw great success this year. They won the Silver medal in the Oshawa Lady Generals fall classic, gold in the Barrie Sharkfest, regular season LLFHL East Division champions, LLFHL Playoff Champions, a bronze medal at the LLFHL Best of the Best championship and finishing fifth in the province. They would like to thank the families, fans, friends and sponsors for the support all season long. -The Bantam A Crunch also took part in provincials, reaching the quarter-finals. They opened the tournament with a 2-2 tie against the North Halton Twisters before falling 2-1 to the Oakville Hornets. They called with a 3-2 win over the Stratford Aces before the Hornets again bested them 4-0 to end their successful season.